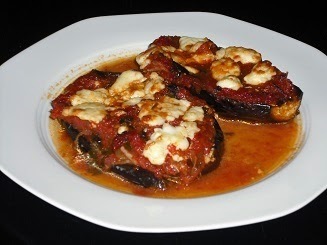 This is another Greek recipe with eggplants and is very easily prepared. Leave them in a bowl of salty water for 1 hour, making sure they are all covered by the water. When you remove them from the water, squeeze them to drain off the water. Put the sunflower oil in a shallow oven dish and place the eggplant halves in the dish with the flat white part facing down. Brush all the eggplants with the oil in the dish. Place in a pre-heated oven at 200 degrees Celsius for 45 minutes. Meanwhile, put the olive oil in a saucepan and heat. When it has heated, add the finely chopped garlic and stir for a few seconds. Add salt and leave to simmer uncovered for approx. 45 minutes, until the sauce has thickened. Add the basil and turn off the heat. When you have removed the eggplants from the oven, transfer them carefully one by one to another over dish – this time with the skin underneath. Spread the tomato sauce over each of the eggplant halves and then spread the crumbled feta cheese over each of them. Put the oven dish back in the oven (which you haven’t turned off) at 200 degrees Celsius until the feta cheese has coloured slightly – approx. 5-10 minutes.